I know a few people who'll appreciate this one. For a brief moment I thought "Wait, can it be!? We have Doctor Fish in Canada!?" No - it was not to be. That's so tragic. But I really can't imagine the service being affordable here like it was in Japan, either. 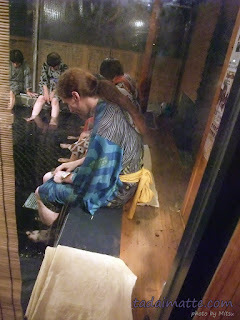 "Doctor Fish" is a spa service that's offered at onsen and Super Sento-type places. You pay between 1,000 and 2,000 yen for about fifteen minutes, depending on the spa. Sitting on the side of the tank, you lower your feet into it and allow the tiny fish (of the Garra Rufa species) to eat the dead skin on your feet. It is maddeningly ticklish but the effect afterwards is very noticeably soft! When I used to see these places - the locations at Tenzan-no-Yu, Oedo Onsen Monogatari and Spa World I encountered multiple times - I usually resolved that I would try one "eventually." I was very glad that I did, as it was an awesome experience. Oedo was quite expensive compared to Tenzan, but as you might have guessed from the photo above, you're paying for the atmosphere! Would you give Doctor Fish a try, or does the idea give you the willies?